I love the bald eagle and all it stands for. So I thought I would do a web-page with some info about the bald eagle and hopefully link to some the excellent sites that are here on the net. Eagle is the name of some of the largest and most powerful birds in the world. Among birds of prey, only condors and some species of vultures are larger than eagles. Eagles look fierce and proud, and they sometimes soar gracefully high in the air. They are often pictured as courageous and have long been symbols of freedom and power. Eagles are careful to avoid danger. They usually stay away from human beings and rarely attack except when cornered. An eagles chief weapons are its powerful legs, feet, and talons (claws). Some eagles also bite in self-defense. Eagles may attack new-born lambs or other livestock, but they do so only rarely. Roman warriors used a golden figure of an eagle as a sign of strength and bravery. Russian and Austrian emperors also used eagles as symbols. The United States chose the Bald Eagle as its national bird in 1782. The life of an eagle in the wild range from 20 to 30 years. In captivity, eagles may live 50 years or more. Mated eagles are thought to stay together. In winter, bald eagles may gather in areas with plentiful food. But during the breeding season, each pair claims a territory around its nest and keeps other eagles away. Nests of eagles are called aeries or eyries (both are pronounced AIR eez or IHR eez). Bald eagles usually build their nests in the tops of tall trees that are near water. Eagles tend to use the same nest every year. However, some eagles have two or more nests. They use one nest one year and the other the next. Eagles build nests mainly with sticks. They often decorate the nest with fresh leaves while they are using it. The bald eagle eats mainly fish. It finds schools of fish by following other fish-eating birds. It snatches fish from the water while flying. A bald eagle can swim to shore with its catch by floating and using a rowing motion with its wings. It sometimes takes fish away from other birds, such as gulls and ospreys. Occasionally, bald eagles catch coots and other water birds by hovering over them and forcing them to dive repeatedly until they are exhausted. In addition, they sometimes catch birds in the air with spectacular aerial maneuvering. The bald eagle is found only in North America and has been considered an endangered species throughout much of North America since the 1960's and 1970's. Until the mid-1900's hunters and trappers killed many bald eagles. The species has been protected by federal law since 1940 in the lower 48 states and since 1953 in Alaska. By the mid-1970's there were only about 2,000 to 3,000 bald eagles nesting in the lower 48 states. By the late 1980's there were about 5,000 or more in the lower 48 states. since then the bald eagle has made a gradual comeback. 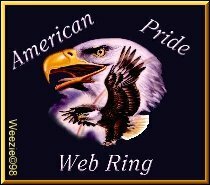 Want to join the 'Save the Eagles' Web Ring? Random Site This American Pride Ring site is owned by: Samsbo.